The Discover Bio Upgrade converts a Discover to a manual microwave peptide synthesizer designed for Fmoc solid phase peptide synthesis. The Discover Bio Upgrade converts a Discover to a manual microwave peptide synthesizer designed for Fmoc solid phase peptide synthesis. The system is capable of manual synthesis of a single peptide. 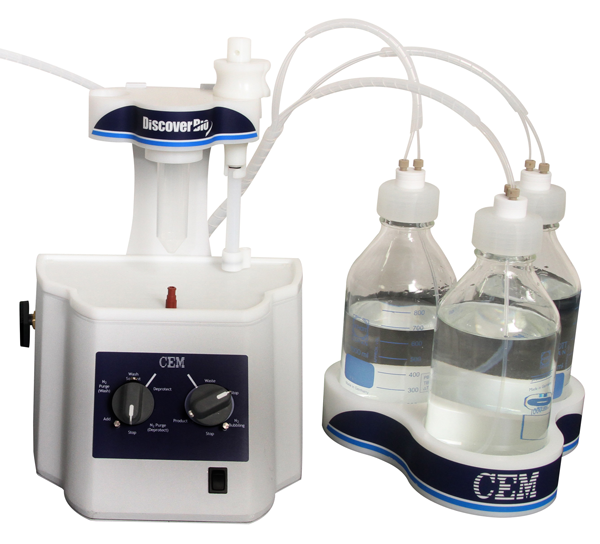 The Discover Bio system uses a Discover single mode microwave reactor that provides for self-tuning with a continuous power delivery from 0-300 Watts in 1-Watt increments. The system contains 2 external ports, one for wash solvent and one for deprotection solution, as well as a 1 L waste container. Aggitation is achieved by nitrogen bubbling.